This picture and information were contributed by Mrs. Sally Phillips Gott of Ozark, Mo. 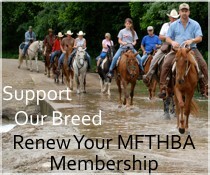 We owe a thank you to Mrs. Gott and to Junior Combs, County Clerk of Christian County, who advised her to contact the breed registry. Mrs. Gott attended the 3-Year-Old Futurity Show and brought us this bit of Fox Trot history. 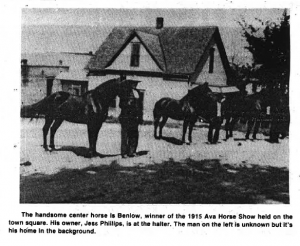 In the summer of 1915 a horse show was held on the Ava, Mo., town square. Spectators crowded along the streets of the square to watch the horses perform their gaits. 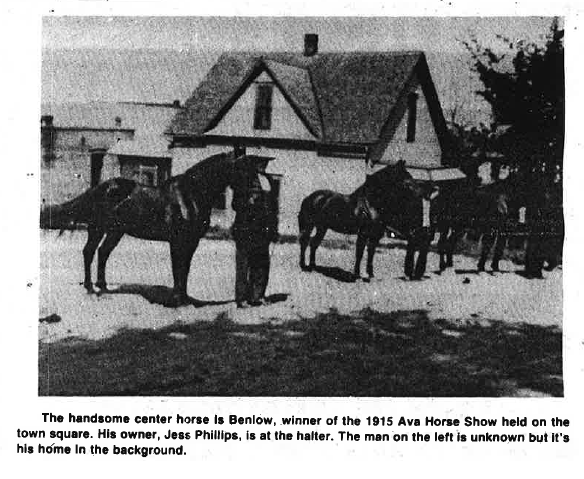 The blue ribbon winner was a dark bay Fox Trotting stallion of Brimmer breeding named Benlow, owned and ridden by Jess Phillips of Jackson’s Mill a small settlement about eight miles south of Ava. The accompanying photo was taken after the horse show at the home of one of the contestants. Jess Phillips was born in 1868. He was a farmer who raised mules and cattle. He kept draft horses and driving horses, but his personal riding horse was the dark bay Fox Trotting stallion, Benlow. Mrs. Gott recalls that her father took great pride in the horse and was very particular about his feeding and complete daily grooming. Benlow’s dam was a dark bay buggy mare named Topsy, but his prized Fox Trot gait came from his sire, an Ava area stallion referred to as a Brimmer. When Jess Phillips’ health ban to fail around 1920, he let his brother, John Phillips of Ava, have Benlow, and Mrs. Gott is unsure what became of the stallion after that. She explained softly that Benlow won only a blue ribbon for being the best horse at the show, but the memory still lights up her eyes after 69 years.